If you're like me, Memorial Day marks the beginning of summer vacation. It's the first weekend that we take the kids on an official family trip somewhere. We chose this year not to camp at a river, since that's where the rest of Alaska seems to go, and, frankly, if I don't enjoy standing in line at the post office, why in the world would I want to line up elbow-to-elbow along a river bank only to catch a fishing hook in my ear? 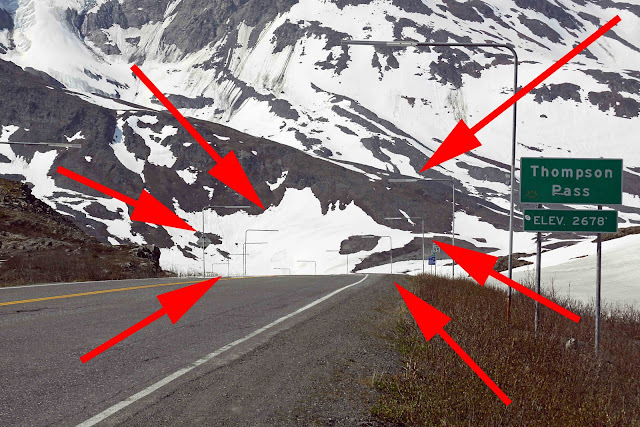 So, this holiday, we headed to Valdez. It has been years since I last visited this beautiful little town where I lived for a time during my youth, and I forgot about the ABSOLUTELY GORGEOUS drive to get there. 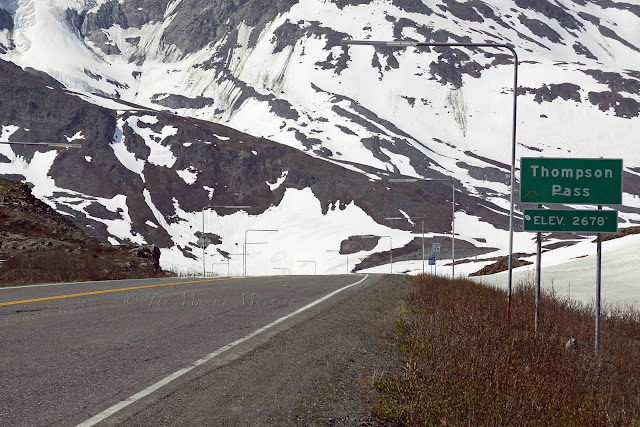 You toodle through the mountains . . .
. . . past a couple of glaciers . . .
. . . over Thompson Pass . . . STOP. I have to quiz you. Any idea what those angled rods are for? 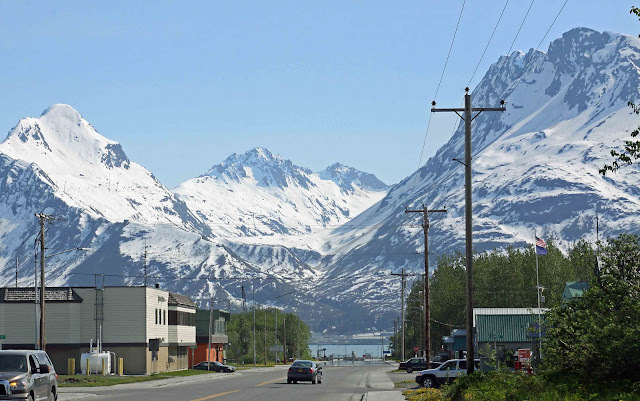 I can tell you from firsthand experience, because my family once got caught in a nasty blizzard as we were returning home to Valdez one winter. Those guides are lifesavers for people driving through blinding, white-out conditions where the snow is drifting and covering tracks of any cars that may have gone before you, when you can no longer see where the road ends or begins. Keep your vehicle between those two rows of markers (you can't tell in this daylight shot, but the top bars hanging across the road are actually reflectors that shine like a beacon in the dark) and they'll guide you out of the Pass. Now where was I? . . . over Thompson Pass . . .
. . . through Keystone Canyon, with its hundreds of waterfalls . . .
. . . to your final destination of Small Town, USA. Breathtaking scenery. I can't even imagine. How can the average driver tell the difference between a mountain and a glacier as they're going past? I can't even imagine having that kind of beauty at my beck and call. 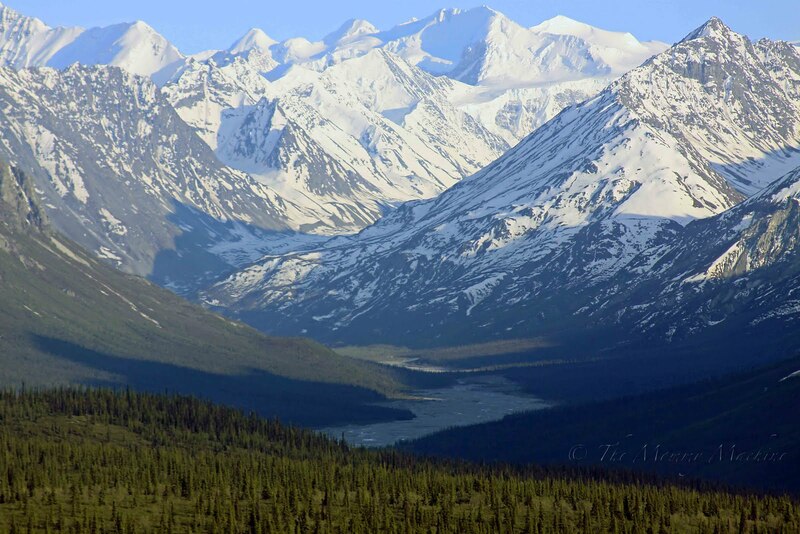 Alaska is on my dream list of vacations, before any tropical paradise! Very interesting about the guides! Oh wow, the scenery is amazing!!!!! I'm so glad you took pictures so we could all enjoy it as well! I can imagine those pole guides have saved more than a few lives! So I have decided that after reading your blog (and seeing your photos) that Alaska is surely on my list of places to live once Im done with school and out of my hometown. Its so goregous! That is absolutely breathtaking. Wow! I felt like I was looking through Brad's pictures of his recent trip to Alaska! Thanks for sharing the beauty! Good question, Michele—The first shot is just mountains, with no glacier. 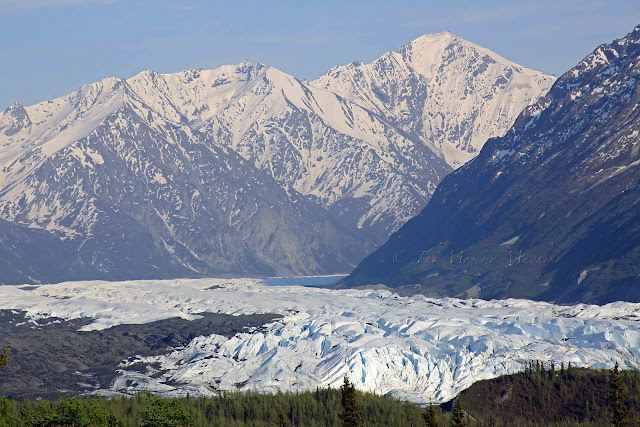 In the second shot, you're looking at Matanuska Glacier. I guess glaciers are not obvious in the winter when all the mountains are white, but in the summer, you can see the contrast better with the white of the glacier against the green. 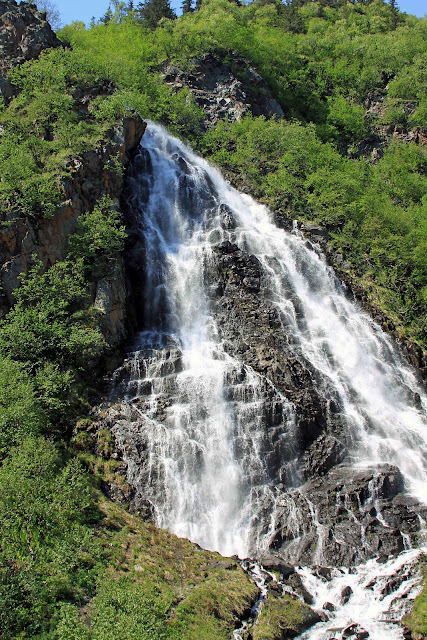 There's also a way that they "flow," looking kind of like an avalanche through a valley, that sets them apart. Came here to your blog from Scribbit. LOVE your photos of Valdeez and the trip there. We drove from Eagle River to Valdeez in July of 2003. Wow was it gorgeous. I have hopes to view it again some day. Seriously, how do you get any work done surrounded by such incredible scenery? ?